Well, this weekend we're off to a campsite in Northumberland, very close to Holy Island - so, not far for us to drive fortunately ... but a much longer trip for those coming from the South. and you made the papers again. ... I wonder who entered those comments below the article ??? 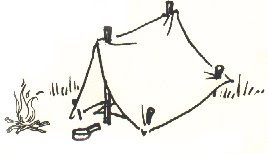 If they had a tent then they could sell the City Chambers and that would solve the budgetry problems at a stroke. Congrats on yet again getting in the papers. "Edinburgh councillors Ewan Aitken, Andrew Burns and Ian Perry are to report to her on renewing local government, with hints this will include control of budgets at council level and young people taking part in decisions." I'll supply a press cutting service at reasonable cost if you are up for it. Hope the camping is going well. I see you also have the ability for a ride nearby - good luck. In Arizona all evening rides are done in the "worse for wear" condition. It's the best way to get home without ending up in the drunk tank. When you fall off, it doesn't seem to hurt as much either. Even if you fall off most nights in a week. Believe it or not, I have ridden a horse in Arizona ... back in 1984!